Natural immunity booster. Maintains healthy metabolism. Aids in general well-being. Delicious vanilla flavour. Contains all natural ayurvedic ingredients. INLIFE Immune care powder is a high quality nutrition supplement which has an individualistic combination of Dadhi mastu ghan ( whey protein ), skimmed milk powder, piyusha ghan ( cow colostrum ), Guduchi , Tulasi and Haridra. 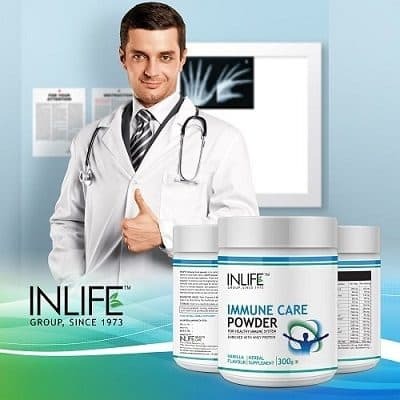 Suggested Usage: Take 10 grams (2 teaspoons) of INLIFE Immune Care Protein Powder twice daily with water / milk or as directed by the healthcare professional. 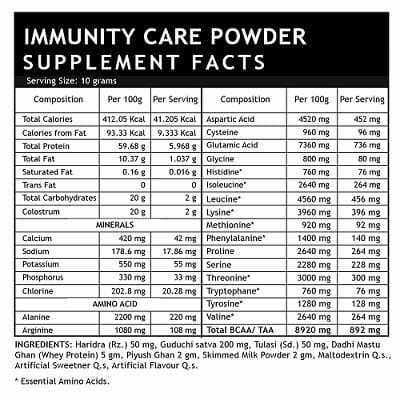 Immune Care Powder is created to maintain all original immune enhancing properties. They are several components in the product that will work together to improve and strengthened your immunity. Haridra is one of the best Ayurveda formulations for body cleansing specially removing the toxins from the blood. The root of this herb consists of Curcumin which has an antioxidant activity. Our whey protein powder does not contain genetically engineered materials. As whey protein have been found to be one of the most complete and biologically active forms of protein that boost up immune system function, improves and increases the ability of your immune system to fight off disease and also counters the effects of ageing, and thereby protect the health. Piyusha Ghan is so nutritious and rich in protein that ancient Indians have simply called it to be Go piyush or Go Amrut. This keeps us healthy by warding off any kind of viral and bacterial infections and helps in boosting immunity. It also has an added advantage of tulasi that will make you less susceptible to infections and immune – compromised. It is minimally processed to best maintain the full range of immune modulating and regenerative components of each herbal ingredient. The supplement helps to keep your immune cells prime and ready for action, also help to recover your immune system faster and return to normal balance. 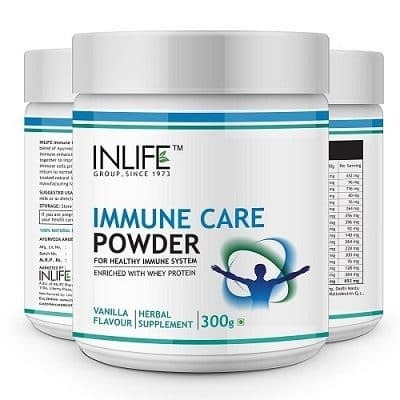 Give your immune system the help it need by taking INLIFE Immune Care Powder Enriched with Whey protein as a part of your “immunity strengthening arsenal” in your daily life – A perfect way to boost your health. Consult your health care professional if you are pregnant, nursing, taking medication or have a medical condition, before using this product. I was taking the supplement regularly and could find changes . It reaches on time liked the service. Great natural product with no side effects. I feel more energetic and well. My immune system is kind of down. I know it did help me. It comes in nice packing and loved the supplement. My wife and I have been using this as an immune system booster. I was using this product on suggestion of my friend as have low WBC count. This powder helps me fighting flu and cold easily. I was using for asthma support and could feel better. This is the good stuff!! !Every one needs a good immune system booster . I have been taking this powder regularly and feeling better. Will keep taking it. It is an efective supplemnet and act as an powerful immunity booster. This is an great products for muscles, backs and inflamation etc. I am using its good product. Another great product by Inlife .I also felt healthier in general, especially during periods of weather change, travel etc.. This is a great product. I was getting sick and never feeling better over and over again i had to take antibiotics but now I feel a lot healthier overall. I recommend this product to anyone looking for an improvement in their health. This product is really good because I have Arthritis and it is so hard to boost immunity, and it work well. During my recent doctor’s appointment we found that my white blood cell count was low. While I generally don’t get sick very much, I was concerned about my body’s natural ability to fight off infections. So, I went looking for something to boost my immunity . It keeps me feeling healthy and I can avoid using prescription meds for cold sores! Mostly winter are season for getting colds. So far, once a day Immune Care has made it a good season. it worked for me as an effective antioxidant. I was taking as was injured & was taking as a recovery supplement says was finding better after started consuming them. Seen improvement in my child’s health as it helped him to metabolize the food and made him healthy and happy with the supplement. Love this supplement. Seems to have helped me avoid getting sick even my kids but so far they seem to work as long as you take them regularly of course. It is enriched with whey protein helped me in muscle recovery. “I feel more calm and relaxed without feeling drowsy or fatigued. I will definitely be purchasing more of this in the future.Thanks INLIFE ! It has a pleasant smell and taste . I have tried other immunity boosters in the past but they haven’t worked but now i am satisfied with results of INLIFE brand . It works effectively i am an older woman and have had pneumonia, bronchitis. It is a high quality nutrition supplement which has an individualistic combination . I have been taking this product daily now and have noticed a definite improvement in my energy levels. An excellent combination for boosting immunity as It identifies and attacks a variety of threats, including viruses, bacteria and parasites.